Declassified documents revealing concerns about Muckamore Abbey Hospital as far back as 1994 are further evidence of the need for a public inquiry, a patient’s father has said. The facility, for patients with severe learning and mental health issues, is at the centre of a major police investigation into the alleged abuse of patients by staff. Police have been reviewing thousands of hours of CCTV footage, some of which the Belfast Trust has said shows patients being mistreated by staff. There are a host of other concerns about the facility, including worries about a current staffing shortfall. There have been calls for a public inquiry from both patients’ families and the DUP, Sinn Fein and SDLP. The News Letter revealed on Monday that there were serious concerns about the hospital nearly 25 years ago. 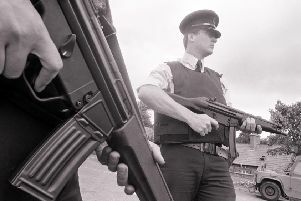 Declassified documents show that civil servants were warned in 1994 of problems at Muckamore — but the Northern Ireland Office refused to accept that. The declassified file contains portions of a report that identified a “serious” deficiency in psychology provision and a host of other concerns. The document also states that the NIO did not “accept” the “validity” of the findings. The father of a Muckamore Abbey patient said the revelations are “further evidence” of the need for a public inquiry. He pointed to the public outcry that followed the Winterbourne View scandal in England in 2011, when staff members were secretly filmed by undercover journalists abusing patients at a care facility in Bristol, as primary evidence for the need for an inquiry into Muckamore. The Winterbourne scandal resulted in several prosecutions and government investigations into the wider care system. The parent, who has requested anonymity, said: “The severity of what happened at Winterbourne View warranted an independent investigation. Informed police sources have told me that this is worse — so on that basis alone I believe a full public inquiry is required.